19 years ago, a fearless young lady at 21 years old decided to stand up for a cause that she passionately believed in. It seemed anomalous; having that she disrupted a United Nations conference on Population and Development for several hours. Anna Halpine may be a new name to you but to World Youth Alliance, Anna is the true definition of audacity. Allow me to bring you up to speed with the foundation history ignited by this daring young lady. While observing the 1999 Conference on Population and Development, she witnessed a group of thirty two young people make a statement. Claiming to represent all three billion of the world’s youth (imagine that), they demanded that the following policies be put into place: abortion as a human right; sexual rights for children; and the deletion of parental rights. Here is the sad part; this group of young people characterised these as necessary for development, but ignored basic needs such as clean water, education, and employment. This spurred Anna to action. The next morning, she returned to the Commission with a few others and distributed bright pink flyers offering a more holistic view of the human person and human needs. Read the full story here about WYA. The main question Anna asked herself is “Do these youth represent me?” I implore you as well to take a moment and ask yourself the same question. If we could stage a replay of the 1999 Population and Development conference, how many of us would be willing to take a stand and objectively challenge principles imposed on us? Would we stand up for a different reality? In my current generation of trending hashtags, trying out each hyped challenge, and keeping up with whoever is on top of our playlists, we have forgotten our foundational values. In our quest to find identity in the formative stages of our lives, we have lost our moral compass. It is easy for us to simply do life, never questioning the why. We see a tattoo on a celebrity; guess what? We want it. We see a catchy vulgar phrase on a famous person’s t-shirt, it becomes our life motto. We hear a politician speak ill of another leader, we laugh at it. Someone gets raped, we create memes. At 21 years old, most young girls dream of being famous. They yearn recognition, affection and publicity. The ‘Socialite’ craze is now the way to go. “How will I afford a Ksh. 4000/ USD40 lipstick?” The “sponsor” of course! This is not to imply that our parents/guardians can’t afford to fund our youthful lavish lifestyles or every young girl who posts on social media platforms about their endless trips to Hawaii, Ksh. 80,000/ USD800 spa day with super long, multi-coloured stick-on nails and exaggerated make-up is one of ‘theirs’; I’m simply giving an overview of the peer pressure we face in a quest for identity and a need to belong. As a young girl, I was presented with an unspoken list of what is ‘acceptable’ in the society. I couldn’t and have never been able to tick off all the boxes because really no one can fit the perfect description of a dynamic society. When I give my opinion, ‘mimi ni kujua’ (I’m a Know-it-all). If I’m assertive, ‘Mimi ni kimbelembele’ (I am antagonist). If I get my PhD by 30, I will not get a husband. If I tirelessly pursue my goals, I’m intimidating my peers. I won’t even talk about the bad jokes about my rich dark skin complexion or the need to have a certain body type. So I ended up restraining my abilities to fit a box. In order not to get disappointed, I was advised to have little or no expectations. But isn’t there more to a woman’s life than hair, make-up, loving your in-laws and gossip!? 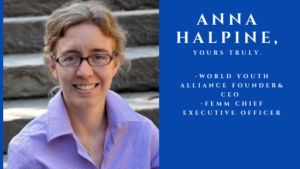 So it begs the question, “May the real ‘Anna Halpine’ please stand up?” Anna Halpine here is a figurative symbol of objectivity and a voice of reason. Who really represents us as youth? As the human race? Who are our role models? Who in my generation will refuse to fall into the trap of bad-followership? Who will be the young lady who dares to dream beyond her age? Who will be the young man who advocates for pro-life campaigns? Who will defend the honour and respect of the human person? What will you be remembered for? How we will answer these questions will determine the future of generations to come. Living for the truth is costly and so allow me to present to you a feasible solution. The solution lies in demystifying the lies that have been presented to us about the human person – You and I. Nothing promotes a guided view on life than The WYA Charter. I invite you therefore to be on the right side of history by joining a global coalition of youth who identify with the right values. Be the ‘Anna Halpine’ of today! Written by Karen Kilwake, a current WYA Africa Batch 3 2018 intern from Kenya. "Dream, Believe and Make it happen"